On a Jeep Wrangler there are four control arms per axle - two on the bottom (called lower control arms, or LCAs) and two on the top (called upper control arms or UCAs). 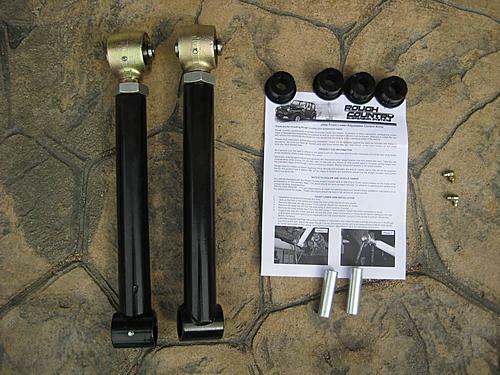 These control arms connect the frame of the Jeep to the axle in a scissor style, allowing the axle to move up and down as you go over bumps, rocks, etc. 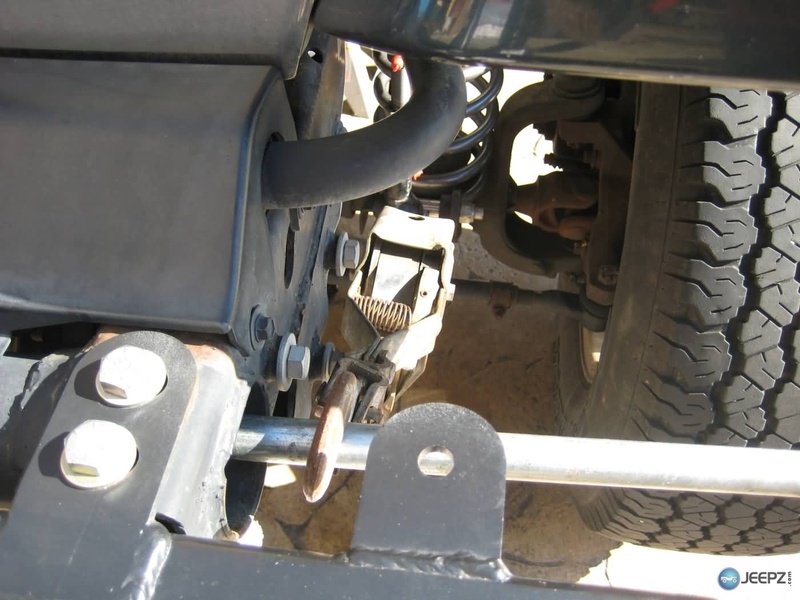 On a stock Wrangler, these are simple pressed pieces of metal in a U shape and are what's know as "fixed length" meaning they can't be adjusted longer or shorter. 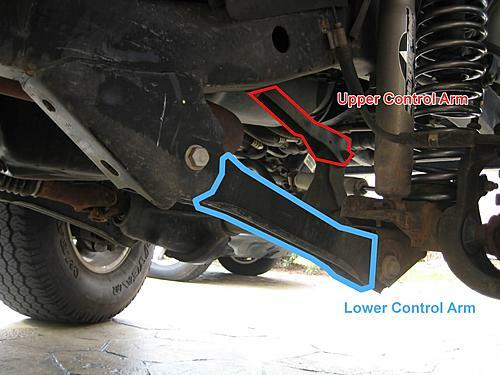 So, why install new control arms? 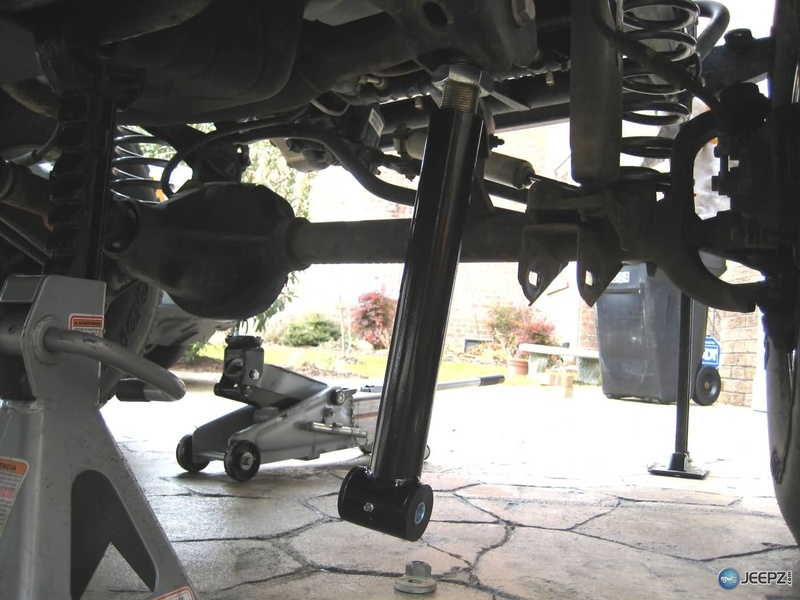 The most common reason to install new control arms is to help restore proper suspension geometry after installing a lift. 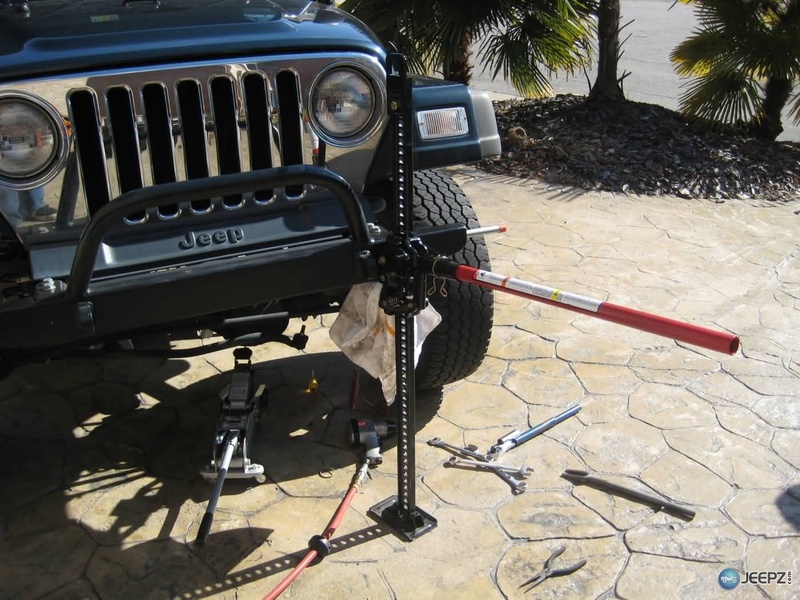 When you install longer springs on your Jeep, the axle is pushed downward, away from the body of the Jeep. 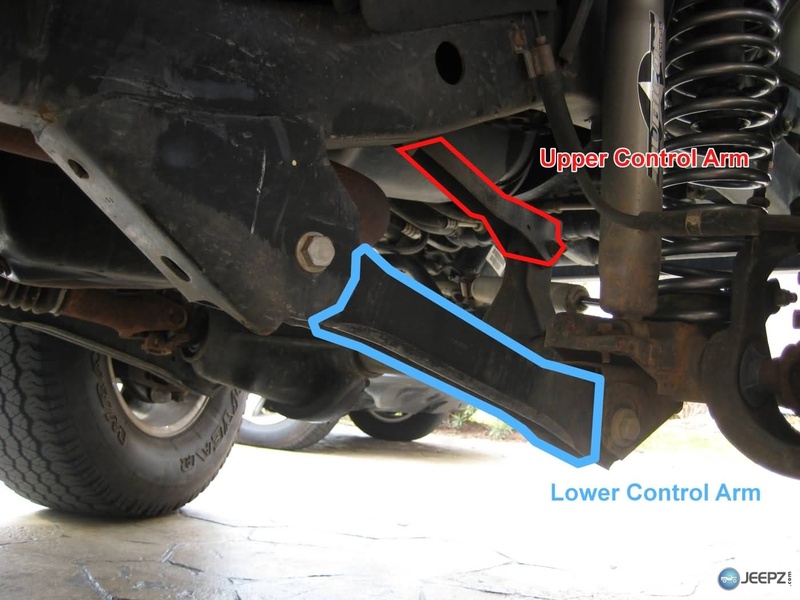 Since the lower control arm is a fixed length, it is forced down, and back towards the body of the Jeep. This is like the hands of a clock - when the minute hand is at :20 it's farther to the right than when it moves down to :25. 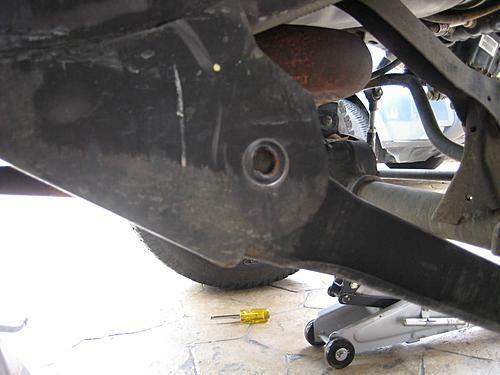 So, to restore the proper axle position (and caster) we'll need to lengthen the lower control arms. 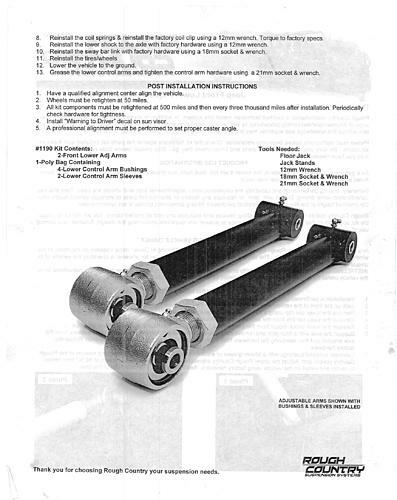 In this photo you can see the stock upper and lower control arms. We'll be unbolting the bolts on each end of the lower control arm, and just replacing it. That's it - two bolts per arm. Last edited by TerryMason; 04-17-2016 at 04:04 PM. You can see the stock lower control arm below - it's just a thin piece of metal , more than enough to handle the front to back forces that are exerted on it during daily driving, but not so much when it comes to any side to side pressure (i.e. rockcrawling). Last edited by TerryMason; 04-17-2016 at 04:05 PM. 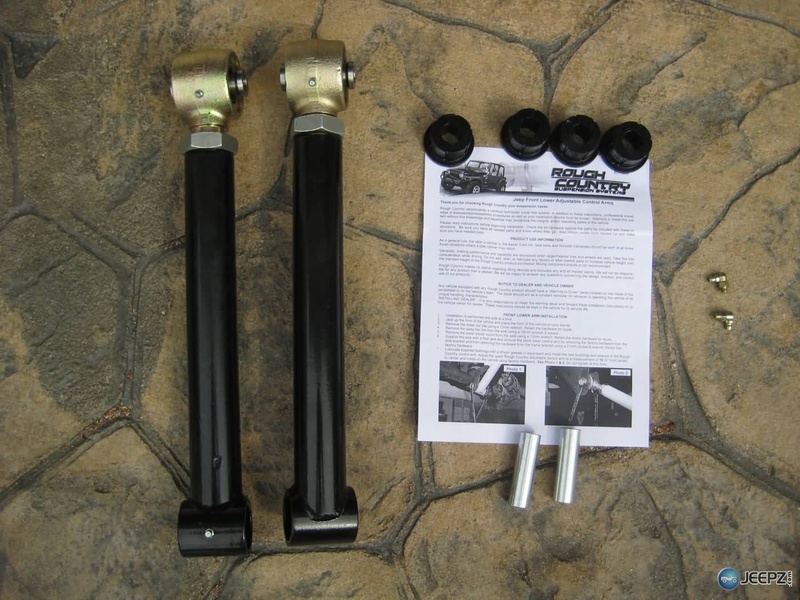 These are my new Rough Country X-Flex lower control arms - they are considerably stronger than stock and include flex joints, polyurethane bushings, sleeves, and grease fittings. 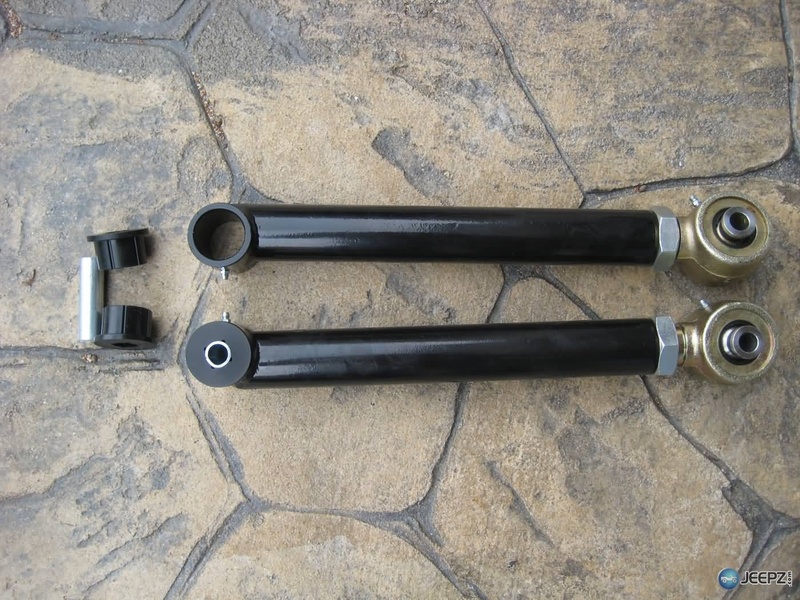 These allow for some side to side movement of the axle. Last edited by TerryMason; 04-24-2014 at 03:01 PM. You will want to remove the lower control arms one at a time, so the axle doesn't shift too far. Just unbolt both ends of the control arms and pull the bolts. Last edited by TerryMason; 04-17-2016 at 04:06 PM. 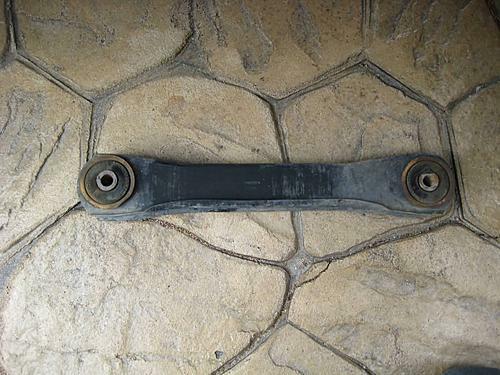 Once you've got the old ones off, begin installing the control arms. I began by setting the new control arms a half inch longer than the stock ones. 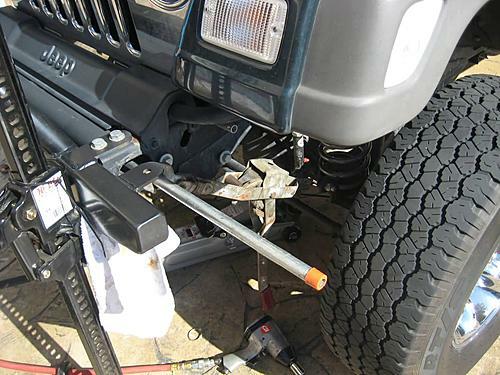 Then bold the control arm into place. 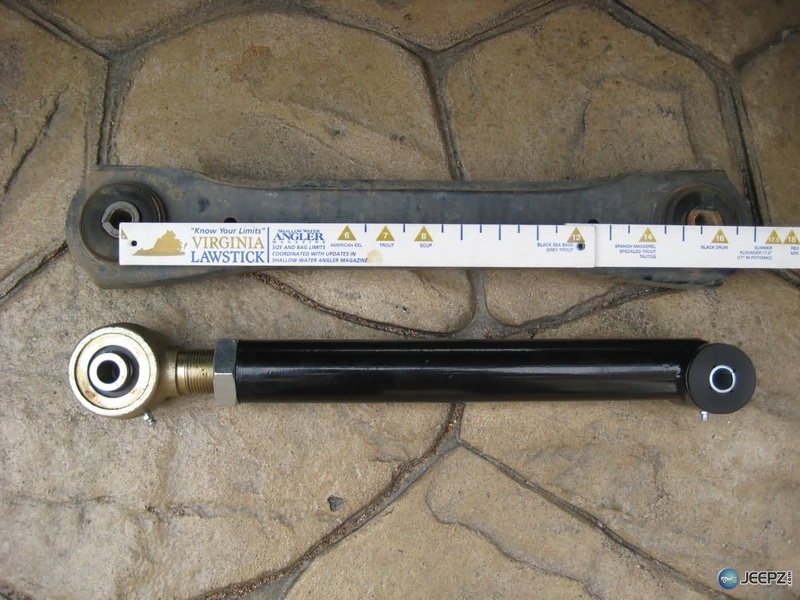 Begin with the frame side, making sure that your grease fittings are pointed up (they'll be torn off on a rock if you don't). 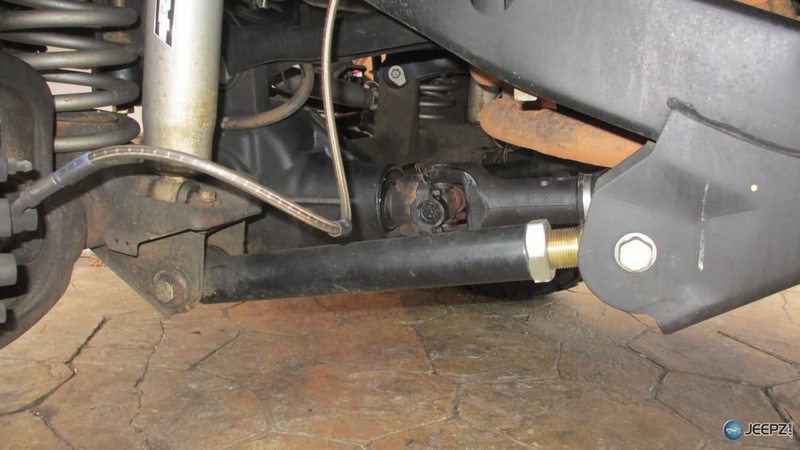 You can see from the photos below the flex that these control arms allow. Your axles can now shift left and right without destroying your control arms. Last edited by TerryMason; 09-27-2013 at 10:39 AM. 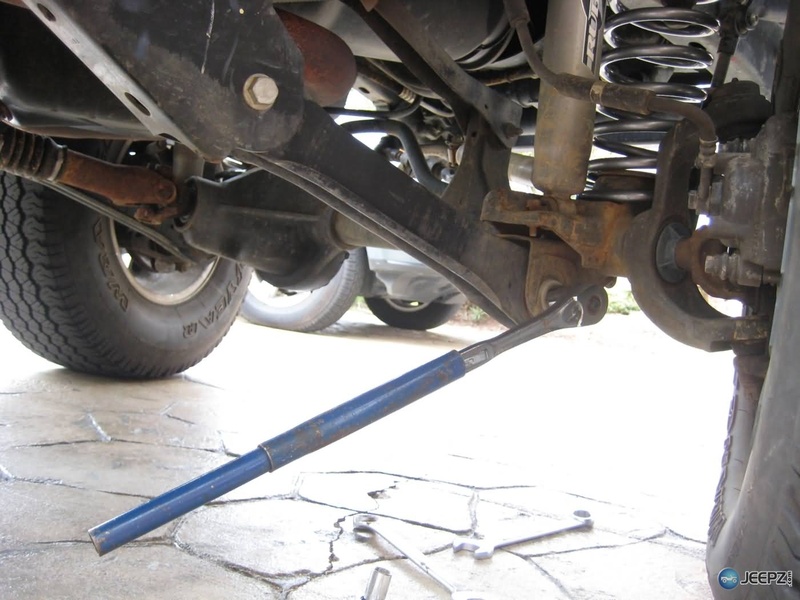 Putting in the first control arm was fairly easy for me, since the stock control arm on the other side held the axle in place. When I went to install the second arm, then bolt holes would't line up. I lifted that side of my Jeep and used a come-along to pull the axle into position. 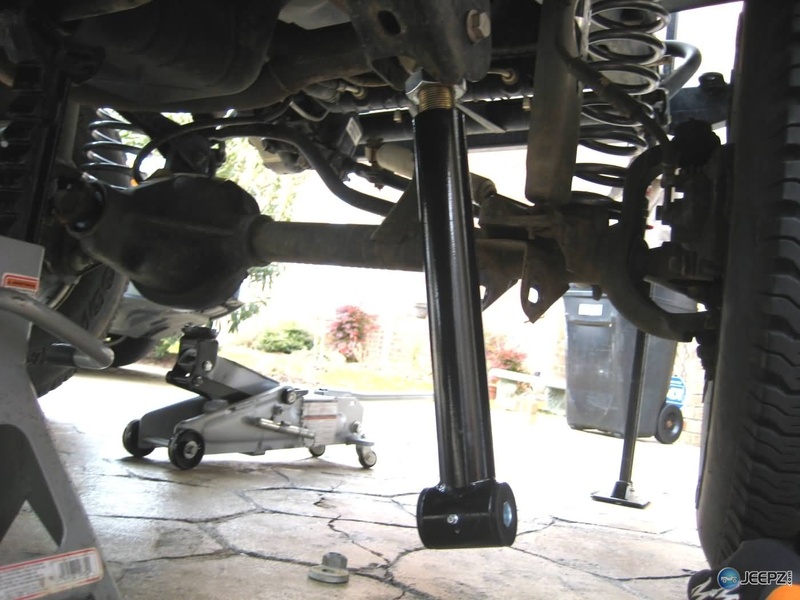 Once you get the axle into position, you just slide the bolts into place and finish up. Last edited by TerryMason; 04-17-2016 at 04:08 PM. You're now finished with the initial install, but there's still work to do! You'll need to either set your own caster angle, or go to an alignment shop and have it done. What this means is that they will either lengthen or shorten your new adjustable control arms to match what the computer tells them. 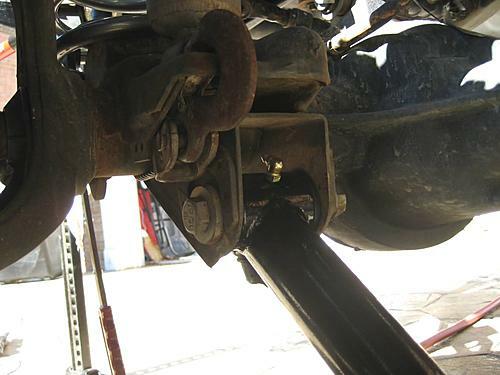 Keep in mind that the proper caster for a lifted Wrangler is typically less then stock. 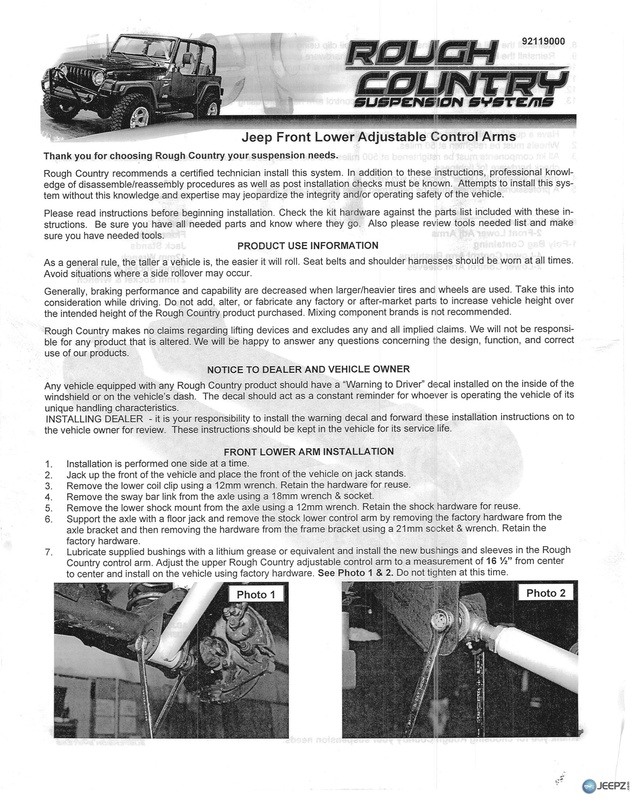 Stock specs for a Wrangler are 7-8 degrees while most lifted Wranglers do well with 5-7 degrees. This will most likely take some trial and error on your part. Last edited by TerryMason; 01-01-2013 at 08:21 PM.